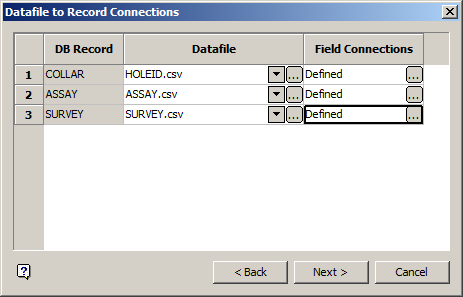 Maptek Chronos scheduler uses Microsoft Excel as a platform to perform scheduling operations. This should make it easy to open the schedule on any computer that has Excel 2007 and above. Unfortunately, this is not always the case. The instructions below are one method to open a Chronos workbook on any computer with Microsoft Excel 2007 and above. To open the .chronos_xls file in excel 2007 and above you may need to assign the default program with which this file type opens on your computer. 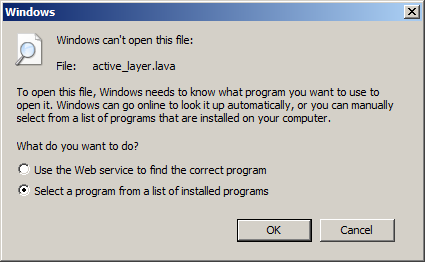 When you double click on a file type with which your computer is unfamiliar you get the ‘Windows can’t open this file:’ error. Click the radio button ‘Select a program from a list of installed programs’ to specify Excel as your default program for .chronos_xls files. This will bring up the ‘Open with’ panel. 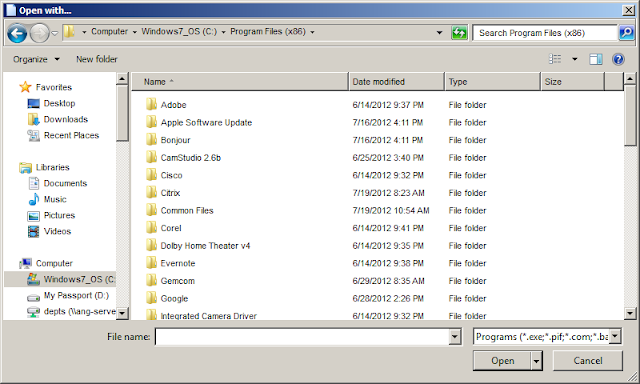 Alternately, you can right click on the file and select ‘Open with’ from the context menu that pops up. This will also bring you to the 'Open with' panel. 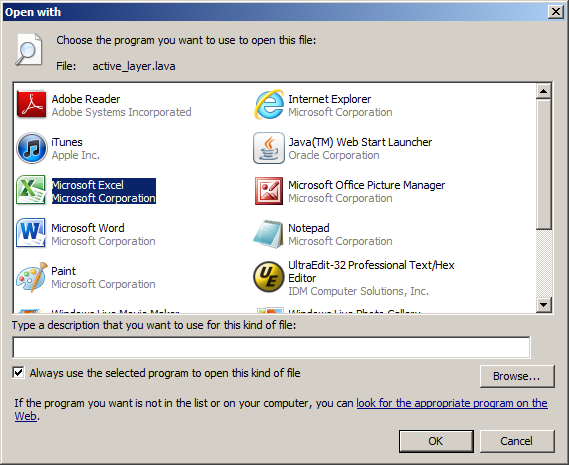 If Microsoft Excel is listed as one of your default programs select it and click ‘OK.’ If Excel is not an option you will have to browse to the location where Excel is installed on your computer. 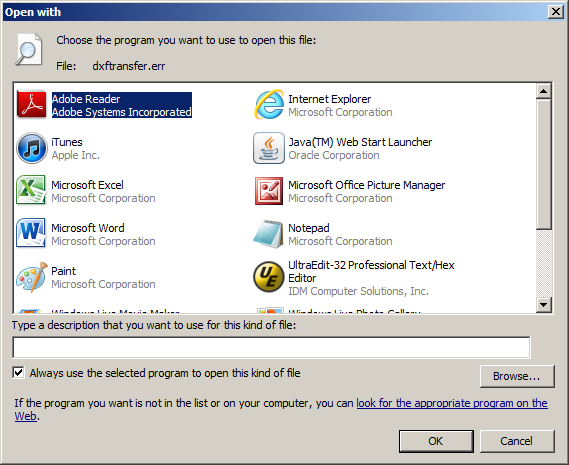 In either case be sure to check the box ‘Always use the selected program to open this kind of file’ so that you don’t have to repeat this procedure next time. 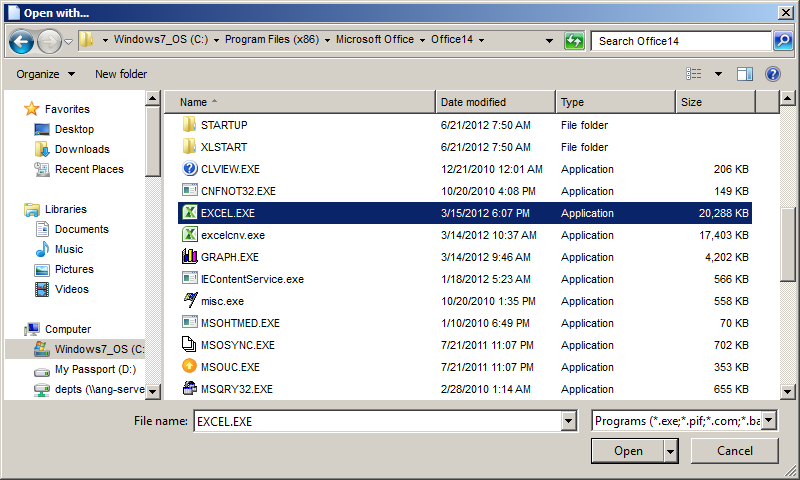 To browse to the location where Excel is installed click on the ‘Browse’ button. 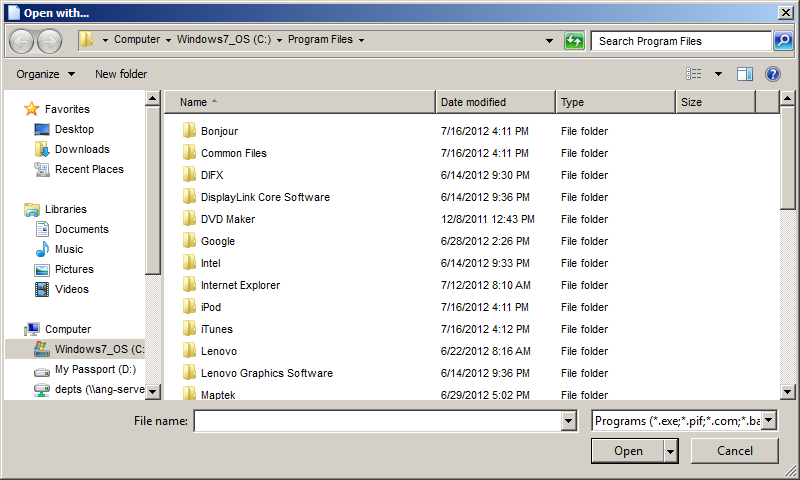 This will open the browse explorer panel in your ‘Program Files’ folder. This seems like the right location until you realize that only 64-bit programs are installed into this folder and that Microsoft Excel is a 32-bit program. Navigate to the ‘Program Files (x86)’ folder (the place where 32-bit programs are installed) by clicking on your C: drive on the left of the panel and then double clicking ‘Program Files (x86).’ Now we are in the correct starting location. From here we want to navigate to the ‘Microsoft Office’ folder and then to the ‘Office14’ folder. 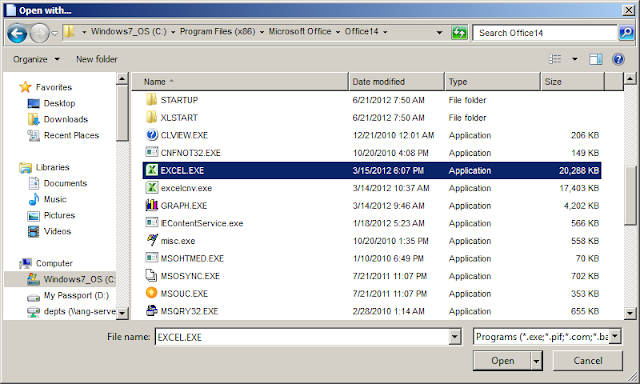 Next select ‘EXCEL.EXE’ and click the ‘Open’ button. Excel will now open but it will warn you that the file contents are different from the format specified by the file extension and ask you if you are sure you want to open it. Go ahead and click the ‘Yes’ button. According to Microsoft support there are methods you can use to avoid all warning messages when opening a *.chronos_xls file in Excel (see this link: Microsoft Support). These methods include setting group policy or making registry edits. This is more in depth than I care to go even if you could convince your IT guy to give you privileges to make it happen. Just click the 'Yes' button when opening *.chronos_xls files in Excel. That’s it. Chronos workbooks will now open in Microsoft Excel every time. With the exception of the file type warning, the entire process will now be automated. Give this a try and let me know how it works for you. I really like your blog post.Excel Training NYC is the best training insistitute to get more knowledge about the Excel. Amazing facts about excel.If Microsoft Excel is listed as one of your default programs select it and click ‘OK.’ If Excel is not an option you will have to browse to the location where Excel is installed on your computer. In either case be sure to check the box. 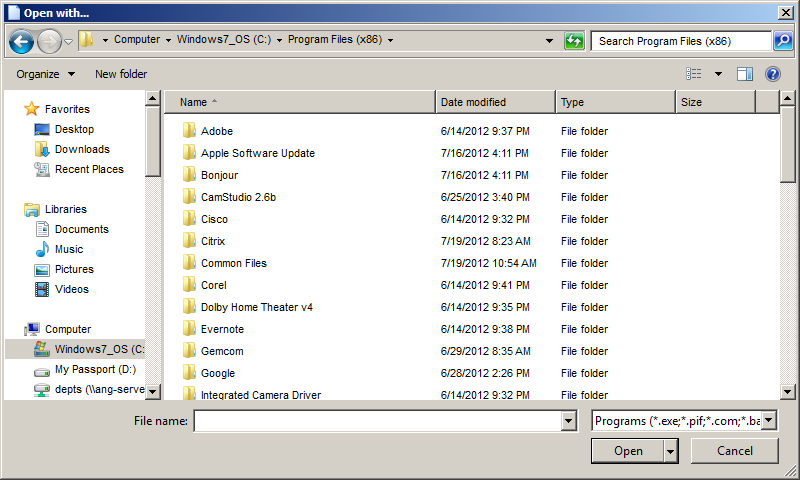 Always use the selected program to open this kind of file so that you don’t have to repeat this procedure next time. is there anyone can use vulcan chronos and have tutorial? Please contact amaraa10a@gmail.com.